I'd like to welcome all new readers to my blog. I know some people are coming from the Best Posts of the Week blog, and I recently joined flikr. Thank you to both new and current readers for stopping by to see what I have to say. I really appreciate the support. If you like what you see, I hope you'll stay a while. You can do what I used to do, and check this page regularly (or occasionally) to see if there's anything new. Or you can do something a lot easier: subscribe to my blog. What is subscribing? It's signing up for updates so that you can find them easier. Subscribe via email - This way you can have my blog posts sent directly to your inbox. If you only read a few blogs or you don't want to have to check a lot of different sites each time you get on your computer, this might be the best option for you. Follow me with Blogger - If you have a blogger account because you have your own blog or because some of the blogs you read don't allow anonymous comments, then you can follow me, and my posts will show up on your Blogger dashboard. Conveniently, if you later open a Google Reader account, all the blogs you follow will also be in the reader. I subscribe to blogs for several reasons. It's easier to keep up with blogs that I find interesting as I go about my business. If I find a post that I particularly like, I can mark it as a favorite so I can find it again (it's one way I build my linky posts). It also helps my favorite blogs with their stats - they can show advertisers or companies with giveaways that they have a high traffic and are worth the investment. I use Networked Blogs on Facebook also, although I primarily see it as a way of advertising my blog to those who might not know about it already. I've found that Networked Blogs is too difficult to use to keep up with the blogs I enjoy, so I use it to find new blogs and then subscribe to them through Google Reader. Do you use a blog reader? Why do you subscribe (or not) to favorite blogs? Doesn't this ice cream look delicious? It was. 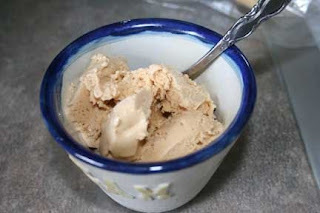 For our Memorial Day 2009 cookout, I got the bright idea to make Irish Cream Ice Cream. The recipe calls for 1 1/2 cups of Irish cream liqueur to be cooked down to 1/2 cup (I used Bailey's). The idea is to have a full flavored, smooth ice cream that actually freezes (unlike other recipes I've seen that just have a couple of shots added to the mix). I started to feel a little woozy and dizzy. It got worse and worse until I could barely stand. I had felt funny earlier in the day, and started to worry that I had a virus and would have to cancel our party. Finally, I called my husband into the kitchen and told him I'd have to go lay down because the room was starting to spin. He said when he walked into the kitchen he was hit with the smell of the alcohol. I had to go lay on my bed and stayed there for hours. No one else was allowed to come into the room or get on the bed because it made the spinning worse. So this is the story of how I got myself drunk while making ice cream and the story of why I'm not "allowed" to reduce liqueur the day before a cookout anymore. We definitely don't have time in our schedule of making fun foods for me to lay down for hours in the middle. Fortunately, I felt much better the next morning, and the ice cream turned out smooth, creamy and (in my opinion) rivaled Haagen-Dasz as a premium ice cream. We didn't serve any to small children, though, just in case all the liqueur didn't cook out. The lesson here is to turn on the fan when reducing large quantities of liquor! I got the recipe from The Ultimate Ice Cream Book by Bruce Weinstein. Seriously, if you want to make great ice cream, I highly recommend this book. There are lots of wonderful flavors included and for each recipe, there are multiple variations. Bring the liqeuer to a simmer in a small, heavy saucepan placed over medium heat. Cook until te liqueur is reduced to about 1/2 cup, 5 to 7 minutes (note: it took me longer than this, and you need to turn on the fan!). The liqueur will appear thicker and slightly syrupy. Set aside. Bring the milk to a simmer in a heavy medium saucepan. Slowly beat the hot milk into the eggs and sugar. Pour the entire mixture back into the pan and place over low heat. Stir constantly with a whisk or wooden spoon until the custard thickens slightly. Be careful not to let the mixture boil or the eggs will scramble. Remove from the heat and pour the hot custard through a strainer into a large, clean bowl. Allow the custard to cool slightly. Mix in the reduced liqueur, cream and vanilla. Cover and refridgerate until cold or overnight. Stir the chilled custard, then freeze in 1 or 2 batches in your ice cream machine according to the manufacturer's instructions. When finished, the ice cream will be soft but ready to eat. For firmer ice cream, transfer to a freezer-safe container and freeze at least 2 hours. I use Cuisinart's ice cream maker that has a freezer bowl instead of using ice and rock salt. They're about $50, but are a great investment if you enjoy making ice cream. We've had ours for years, and it works great. Personally, I'm not a huge fan of right-out-of-the-maker ice cream. I find that it melts far too quickly for my taste. I put my ice creams in freezer-safe containers and let them "ripen" for 2-4 hours or overnight, depending on when my party is (or how long I'm willing to wait). It brings the texture much closer to premium ice cream which I appreciate. I've also made the ginger ice cream from this book. I thought it was fabulous, but I'm a ginger nut. I've been considering making an ice cream from Captain Morgan's, although I suspect I'm the only person who would enjoy rum flavored ice cream. What's your favorite ice cream to make? Oh, and in case you were wondering, I painted that cute little bowl at Louisville Stoneware's paint-your-own studio a few years ago. Ice cream seems all that more special eating from this bowl. I had grand plans to post yesterday, but I wasn't able to finish in time and yesterday's post will be available tomorrow. Instead, I spent the majority of yesterday getting tested (along with my husband) for allergies. I have been battling eczema and sinus issues for most of the time that I've lived in Kentucky. I don't remember having allergies, seasonal or otherwise, when I lived in Georgia. It turns out that I have some common allergies, such as dust, mold and grass pollen, and one that completely shocks me: I'm allergic to my cat! I've had cats since I was two years old (although they were always outdoor country cats) and we've had our indoor, sleep-in-our-bed cat for nearly nine years. I never suspected that I might be allergic to her! We won't be getting rid of her (the doctor didn't even suggest it, fortunately) but we will be taking measures to limit our exposure to what's bothering us. This means a campaign to clear out clutter in our home. One of the suggestions from the doctor was to limit our stuffed animals and wash them regularly in hot water. I'm wondering what this means for my new interest in making dolls. I'm a little overwhelmed by the implications, but am looking forward to a future where I can breathe and don't itch. Wish me luck! Wish me luck. This is going to be an interesting ride for this nature girl. Yesterday was nearly over before I realized it was the equinox. So that makes today the first official day of fall (or was it yesterday? I get confused). I used to love this time of year, with its introduction to warm sweaters, and changing leaves, and crisp air. The sky always seemed bluer in October, and the smell of wood smoke was thrilling (we had a wood burning heater instead of central heat when I was growing up). When I was nineteen, though, my PawPaw passed away in October. The following year, I lost a close friend in November. A couple of years later, another close friend passed away in December. Then there was September 11, 2001, and then the loss of yet another close friend. Fall started to be associated with loss and grieving and even when I didn't think about it, I began to notice that my whole demeanor changed starting in October (and then starting in September). My body grieves even when I don't consciously acknowledge it. Also, I moved to Kentucky from Georgia ten years ago and I have yet to get used to the longer winters. Actually, I don't plan to get used to the longer winters. I'm just tolerating them until I can get back to the short winters I love (I miss spring arriving in March instead of May). All of this is to say that I'm still in a little funk and I'm having trouble writing. I was proud of myself for getting into a rhythm of posting each weekday, and now I've missed several days in the past few weeks. Oh well. I do have a lot to share, I just can't seem to figure out how to say it. This post is kind of my attempt at "writing through the block" or whatever you want to call it. I'm also incredibly busy. Among other things, I'm making Abigail's Halloween costume, which involves using an actual sewing pattern for the first time. I didn't know it was so tedious. Last year, I posted a fall to-do list to help me enjoy the season instead of dreading it. I didn't get to everything on my list last year, and I'm considering writing another for this year. What fun things does you family like to do during autumn? I'd love some ideas. I just checked out (again) from the library the book Rag Dolls and How to Make Them edited by Dorothea Hall where I got the pattern for Abigail's doll. I was so excited that it wasn't destroyed in the recent flood. I thought I'd share some of the books I've found for doll and toy making in the past year. Rag Dolls and How to Make Them edited by Dorothea Hall - The pattern I used for Abigail's doll is the "pocket doll" that can also be made into a bunny, a mermaid and an angel. It's a simple pattern that is shown full size in the book. There's a pattern for an upside down doll with two faces. You flip the dress and it's a different character. It reminds me of one I had when I was little. There are several old fashioned dolls that can be easily modified. Felt Wee Folk: Enchanting Projects by Salley Mavor - How to make small, flexible dolls for nature tables and dollhouses. Some ideas are simple and some are more complex. Sewing Tiny Toys by Carolyn Vosburg Hall - Contains patterns for beanie baby type toys. A lot of really cute ideas. Adorable Sock Dolls to Make and Love by Connie Stone and Emola Lowe - Good instructions. Mostly animals - love the cow and giraffe. There are also cute Santa and witch dolls. Bean Bag Buddies by Nikki Wheeler - More beanie baby toys. Sock Doll Workshop: 30 Beautiful Dolls to Create and Cherish by Cindy Crandall-Frazier - Includes a baby doll pattern using three socks. I really want to try that pattern. Country Dolls by Better Homes and Gardens - Includes prairie dolls and Indian dolls that remind me of dolls my grandma made. There are also patterns for dollhouse dolls from 2 inches to 6 1/2 inches. Cherished Dolls to Make for Fun by Better Homes and Gardens - Lots of great doll patterns. I especially like the baby doll embroidered with wishes and signitures from loved ones and a country rag doll design. Some of these books are still in print, but it looks like they can all be ordered used from amazon. I know there are a lot of new doll and softie books, but I haven't been able to find them at my libary and I doubt they'll get them anytime soon. I just thought I'd share my list with you so you can check your local library if you're so inclined. Enjoy! "The driving force in the life of a child, starting much earlier than it used to be, is to be cool, to fit in," Alex Grodd told the group. "And pretty universally, it's cool to rebel." The premise is that in large high schools, youth culture reigns and the cool kids generally aren't the ones that are studying and trying hard to get good grades or just to learn (which isn't always the same thing). The article points to a high school that has a low student-teacher ratio and uses community mentors. The kids are kept surrounded by adults. They're required to present their projects to people outside the school. In an environment like this, it becomes cool to try harder. Everyone gets the attention (and the kind of attention) that kids at some high schools get beaten up (or severely made fun of) for getting. So read the article, and let me know what you think. Is "stamping out youth culture" a way to infringe on the rights of children (as one article commenter implies) or is it a way to make sure that all children can participate instead of just the ones who fit in? (Or something else - not trying to imply a dichotomy here.) I kind of like the implications that this has for homeschooling - maybe socialization is not the be all-end all that it's made out to be and may even be the problem sometimes. I've been in a funk all week. I've been fighting it and ignoring it and not understanding it. Today it has hit full-force. I know that today is the Day of Remembrance for September 11, 2001. I remember that day and where I was and the devastation I felt. I remember waking up the next morning, and sobbing when I realized that the day before had not been a nightmare. Like many Americans, I didn't know anyone personally who died that day. I was devastated for the innocent lives lost and for the way my country changed forever in just a few minutes. I know and remember all of this, and yet it's not the reason for my funk (although I'll admit it may be contributing). Six years ago today, I lost one of my dearest friends, and even after all this time I can't stop crying. We met the spring before we started college at a weekend meet and greet for new students. One of us (I can't remember now which one) bounded into the other's room to give an invitation to a play and spent the evening hanging out. We met up again when school started that fall because we were both history majors interested especially in medieval history (although our campus had 500 students that year, so we were bound to meet up again regardless). We hung out with the same group of people. We took most of the same classes. We dragged each other to those classes when one of us was down and didn't want to go. We lived together for a year after college. We ended up working at the historical society together first at the Braves Museum at Turner Field and then in the archives and we shared an office for a while. We often drove to work together. So, yeah, we drove each other insane at times. But there was so much love and shared history between us. I can hear her laugh even now. She had a knack for coming up with crazy stunts to pull, and convincing the rest of us to go along. She wore fishnet hose to a friend's wedding. She planned to give her friend's children tie-died onesies (which I found out at my baby shower three years ago when I received a tie-dyed onesie in her memory). She staged a photo shoot at our college of us groping the Robert Frost statue. She could quote every line from The Princess Bride - and did every time she watched it. I can't seem to convey the sheer force of nature that was Cathy. As mom my said this morning, she was a bubble of joy. I have been working on a scrapbook for her mother and our friends since shortly after I got home from her funeral. I contacted our friends with whom I kept in touch and asked them to share a favorite memory and photo. I've also collected song lyrics and poems that seemed relevant. It has been a far more difficult project than I ever imagined it would be. I wanted it to be perfect and capture her fully. I realize now that would be an impossible task. I think it's time now to finish. Perhaps I'll pop in The Princess Bride (as a mutual friend suggested) while I work. I'm so sorry for the melancholy today. This is why I try not to blog when I'm down. Back to the regular schedule on Monday. Ali Edwards posted a challenge a while ago for her readers to list the 12 stories that they most needed to scrapbook. I've been trying to decide on mu list ever since, and this is what I've come up with. I got kind of vague with some of these. I actually had a different list focused more on people I needed to do pages about, then I read an article in the current Creating Keepsakes magazine and realized that it was for more important to document things about me that could be interesting or helpful to Abigail if I wasn't here to tell the stories myself. I'm qualified to tell my own story best. I have an ongoing project that I started over a year before I got pregnant called a Legacy album or scrapbook. I took a class at a scrapbooking convention in Nashville in 2005 that taught this concept. The teacher's mother passed away when she was very young, so she started this concept for her own children, writing down things about herself that she wished she knew about her own mother. It's a fascinating but occasionally overwhelming project that I think will be beneficial for times when I can't talk to my daughter about some things (cause moms just can't do that). I'm hoping that reading my words won't be the same as listening to me lecture. I can imagine reading something my mama wrote for me being easier for some topics than being in the same room with her (being a teenager is so not fun at times). What twelve stories do YOU most need to scrapbook? As you may have gathered, I love to read. (I've been told by some that I talk about books a lot. I've also been told that I talk about food a lot. Is this a problem? Discuss.) As a kid, I loved that summer was a long stretch of time that I could use to read as many books as possible. Since I couldn't drive and we lived in a very rural area, this meant stockpiling books from the used book store and the library and hoping that I always had a huge selection. This has lead to some serious book hoarding as an adult and made my bookselling career very dangerous to my bank account. I digress. My summers now are much busier than they were, but I still believe in summer reading (even if it doesn't vary much from the rest of the year). Eight Cousins by Louisa May Alcott - One of my favorite childhood books, I thought I would reread it this summer. At first, I wished that I hadn't. It didn't seem as rich or detailed or fun as I remembered (I has similar issues with Little House on the Prairie a couple of years ago.) As I read, though, the joy of the book came back to me, and it's still one of my favorites. Rose in Bloom by Louisa May Alcott - This is the sequel to Eight Cousins. I don't remember ever reading it as a child, but parts of the story seemed very familiar to me. I didn't love it as much as Eight Cousins, but it was still a fun read. A Homemade Life: Stories and Recipes from my Kitchen Table by Molly Wizenberg - This book was all the rage last spring on a lot of the blogs that I read (it's written by the author of Orangette), so I requested it from the library. Apparently, it was popular all around because it took a long time for me to get it. I really enjoyed reading it. I felt like I was sitting over dessert while Molly told me her life story. And I want to try so many of the recipes. I'm considering buying this book because I'll never be able to keep the book from the library long enough to try everything. Harry Potter and the Half Blood Prince by JK Rowling - Actually, I listened to it in the car (which I won't be doing much longer with a two year old). I was trying to get ready for the sixth movie, but I'm glad I didn't finish it in time. The movies are much better if the books aren't as fresh if you love it all as much as I do. Harry Potter and the Deathly Hallows by JK Rowling - This was aslo listened to in the car. When I finished Half Blood Prince, I decided to just keep going and finish the series out on audio. I actually listen to the two books over and over in the car. I could probably recite them if asked. Photo Freedom by Stacy Julian - I've recommended this book in this space before but I just picked up my own copy because I took her Library of Memories class at BigPictureScrapbooking.com and wasn't sure I needed it. I'm glad I did, though, because it's a great refresher for the class. I was able to read through and remember why I scrapbook the way I do, and notice things that I could still implement or change about my system. Handmade Home by Amanda Blake Soule - I'm not sure if I've completely read through the whole book yet since it's largely craft instructions. I really enjoyed reading the chapter on why she crafts and the chapter on visiting thrift stores and how to shop them. Amanda's writing is so different from other craft books. Her writing is just so homey. I will do a post soon about this book and the projects I hope to do. So, what was on your summer reading list? Let me know if you have a title you think worth checking out next summer (or next week). So on Friday I mentioned I was planning to relax this weekend with my family and friends. My husband not only had all three days of the weekend but was also able to take off half of Friday too. Abigail and I had spent a week away and got home late Thursday night, so he wanted to have the opportunity to catch up with her. I'm not sure why I thought I'd be relaxing though since we'd planned to have a few friends over on Sunday afternoon. We have grand plans when invite people over. I insist on making at least two or three elaborate desserts since I don't get an opportunity very often. Lee patties out burgers in advance, and usually gets the idea to try at least one new dish. For this gathering, I chose to make vanilla gelato and chocolate gelato (both from a favorite book - The Ultimate Frozen Dessert Book, which I'm happy to see is not out of print like I thought it was) and a yellow layer cake with fluffy chocolate (buttercream) icing. Lee's new "recipe" was a Chicago dog - basically he had all the ingredients for a Chicago dog for anyone who wanted to try their hot dog that way. Of course, we grill everything, so it couldn't be a true Chicago dog (since they are only steamed or boiled) and while we had celery salt, sport peppers, tomato slices and dill pickle spears, we couldn't find poppy seed buns or nuclear relish. Oh well, it was close. I wasn't thrilled with my gelato choices, either, although everyone else seemed satisfied. I've made pecan gelato before using this book, and while it wasn't exactly like gelato I've had, it was definitely different than any other homemade ice cream I'd made - smooth, creamy, filled with intense flavor. (Gelato is different than ice cream in the use of more whole milk than cream and a lot more eggs.) The chocolate used 100% cacao and was unsweetened. It's very rich, but it wasn't smooth or creamy like I expected - it was actually pretty grainy. I don't know if I didn't cook it long enough or what. The vanilla was the real disappointment though. It had seven egg yolks - seven! - and I expected it to be rich and creamy and wonderful. But it was also grainy and almost crumbly in texture. Both custard mixtures were strained before cooling, so I don't think it was a cooked egg thing. If you know anything about ice cream making, please let me know if you have any ideas on what went wrong. So, anyway, we spent Friday afternoon and much of Saturday shopping and preparing for our late Sunday afternoon get-together. Relaxing - what was I thinking? I love doing this, but I don't know why I thought it wasn't going to be a busy weekend. Abigail was, as usual, not happy when people started arriving at our house, but within an hour she became a social butterfly, showing off her toys and not sitting still to eat more than a bite of burger and a few chips. I was so glad that she started to enjoy herself. We had a wonderful time hanging out with our friends and making new ones. It did start to rain late in the day, but we'd finished grilling by that time fortunately. We were able to squeeze in a game of ladder ball when the rain let up too. And Monday was the lazy, relaxing day I expected, although hubby woke up feeling less than well. I managed to take a long walk with our next-door neighbor, and now feel energized to do some more exercising. Woo hoo! I have a confession, though. I've been out of town so much lately, although you probably couldn't tell by the near-daily posting. I was able to "stockpile" some posts that I knew wouldn't go out of date, and have them post while I was out of town. Silly me, though, I didn't really leave any for when I got back and I'm kind of feeling the just-got-home blues. So I'll try to keep up the daily posting, because I really like it, but I can't promise anything. If you have anything you would especially like to see me write about, let me know. Ideas are welcome! Hope you had a great long weekend, and enjoy the first full week of September. I fully believe in holding onto summer as long as possible, and do not plan to let fall in until later this month. I live in a relatively southern region, I have the luxury! Today is the grand opening of Ella Publishing, the brainchild of Lain Ehmann and Angie Lucas. When Simple Scrapbooking closed it doors last spring, these ladies (Angie was managing editor and Lain was contributing editor) got together and decided to start a new venture in scrapbooking publishing. Their company publishes scrapbooking ebooks. This week, the first three are available and then new books will be released monthly - twelve a year if I read correctly. I'm most excited about the book Quick and Creative Quizzes by Wendey Smedley and Angie Lucas. I love quizzes and find them a fun, quick and easy way to get the personalities of loved ones into my scrapbooks. I hear there's a book by Stacy Julian coming in the near future. Just a few things that I've read recently and enjoyed. I hope you do too. Battling Mommy Brain: 6 Strategies to Boost Brain Health @Simple Mom - I seriously believe that I lost brain cells as soon as I got pregnant and they keep disappearing at an alarming rate. Here's proof that it's not all in my head, and a few ways to combat it. 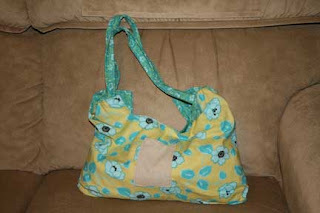 DIY Reusable Lunch Set for School @Make and Takes - A full tutorial for a reusable lunch bag made from an old pair of jeans and instructions for a reusable sandwich wrap. Rain Gutter Bookshelves @Chasing Cheerios - I've seen these before, and seeing them here made me want them even more. I like being able to see the book faces instead of just the spines. This might be a good solution for rubber stamps or magazines and idea books, too. Plaster of Paris and the Best Art Group Project Ever @The Artful Parent - This anything-goes sculpture project sounds like lots of fun! Homemade Empathy Poster @Ohdeedoh - What a cute idea! I'm not sure if my two year old could make all the emotion faces or would understand it all yet, but toddlers do understand more than we give them credit for. I may try this one soon. Painting on Fabric @The Artist, The Mom - Painting on muslin for wallhangings. Actually, she was making nametags but her daughter made a wallhanging. I'm not sure if tempera paint will work - she used fabric paint. Life Story Pages to Print @Becky's Blog (Becky Higgins) - This is an old post that I somehow missed at the time. Becky shares two pdf files with her readers - one for teenagers to tell their life story and one for adults. The way they prints makes two pages per 8 1/2 x 11 sheet of paper, so it makes a half size album. Totally doable. It's just a fill-in sheet, but isn't that better than nothing? It won't take long and then it's done and you can do something more later if you want. Your life story is so important!! The Magic Heart @Unplug Your Kids - An idea for using a symbolic object to remind our family members we love them even when they're grumpy. The author uses a stone heart but the comments also suggest making a softie heart (a usable pattern is available in Handmade Home by Amanda Soule). Photo Album Scrapbooks *10 Tips* @playful.productive.present - Tips on setting up a photo album scrapbook. If you haven't seen one of these, please go to this post. If you think you can't scrapbook because it's just too much, then you've got to see this concept. I'm almost finished with a photo album scrapbook from multiple trips we've taken to the same city, and it's been SO much easier than trying to *scrapbook* all of it would have been. I just got home from a long series of trips that we've taken over the last month, and I'm recovering from some crud I picked up along the way (and shared with my daughter, mama, daddy and two of my brothers). I am looking forward to a long Labor Day weekend to relax with family and friends (and recover). I hope you enjoy your weekend as much as I plan to! We bought our Vitamix in May. I can not overstate how much I love it. I've wanted one since I saw it at the Kentucky State Fair nine years ago and saw how they made salsa, soup and ice cream within minutes of each other in the same container. So when I learned that Costco would be having a Vitamix rep doing demonstrations, I put it on my calendar. I wanted to at least see it again and see if it would cost as much as I remembered. We stood watching through three demonstrations. Our daughter drank juice after smoothie after ice cream and asked for more. And we brought one home. Woo hoo! One of the things I like best is getting all these extra veggies into my diet. I simply don't think about eating carrots and kale and celery and other veggies that much unless it's time to make my veggie soup. 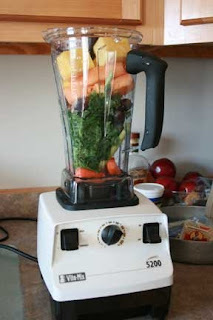 With my Vitamix I'm eating all of those plus multiple fruits every morning. This picture makes me want a smoothie just looking at it. Yum. 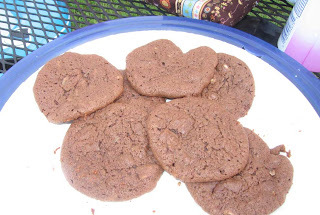 I can't remember when we baked these cookies for the first time. Usually we're chocolate chip people, with an occasional snickerdoodle or sugar cookie thrown in (well, I am and I do most of the cookie baking around here). I think it was probably even before Abigail was born. My husband wanted to try something different and searched through our cookbooks until he found something we both would like. Chocolate? Check. Mint? Check. What's not to like? So he baked them. And we did our usual hot cookie ritual. And we decided to never ever bake these cookies again. They were awful. What were we thinking? Of course, we don't like to waste food. So the next day, we decided to eat the leftover cookies just to get them out of the house. And then. . .what were we thinking? These cookies were wonderful. We wanted to make more so they would be cool by the next day. Wow! By now, we've learned that these cookies are really very good hot and they never last long enough for leftovers. My nephew and father-in-law especially love them. This recipe makes a small batch of cookies (or my chocolate chip cookie recipe makes an exceptionally large batch, not sure which). We found it in Hershey's Best-Loved Recipes, which appears to be out-of-print but worth the search. Beat butter, sugar, egg, and vanilla in large bowl until fluffy. Combine flour, cocoa, baking soda and salt in separate bowl; add butter mixture, beating until well blended. Stir in chocolate and nuts, if desired. Drop rounded teaspoons onto greased cookie sheet. Bake 10 to 12 minutes or until set. Cool slightly; remove to wire racks. Cool completely.